Bill Dunn Jr. marks his publishing debut with the release of “Love and the Infinite, My Memoirs” (published by Balboa Press in August 2017). Set for a new marketing campaign, the book offers readers infinite healing to remove past leftover hurts, including childhood sufferings. Through Dunn’s healing journey from childhood abuse, he realized the many worldly and spiritual strategies that can rescue any adult from negative hangovers as a result of their earlier experience. In the book, he begins by narrating his story and exploring the causes and effects of child abuse. He also differentiates the different forms of love and explains how infinite love — a spiritually based love that goes beyond both conditional love and unconditional love — can heal all. “I don’t think anyone has ever written such a work on abuse, the origins and whys of it, and a complete analysis on a myriad of strategies (with an emphasis on spiritual, non-denominational) to consider for healing from this awful scourge, including ways society itself can heal, (e.g., worldwide public education on proper child-rearing practices), which would actually promote more world peace among people-at-large,” Dunn shares. 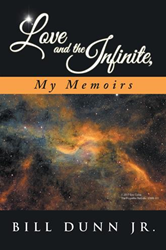 To purchase and know more about the book, readers can visit https://www.amazon.com/Love-Infinite-Memoirs-Bill-Dunn/dp/1504377567. Bill Dunn Jr. is a New England scholar and career environmentalist who writes about his spiritual quest and awakening from early childhood abuse by parents who suffered from emotional and physical challenges. Through his quest for knowledge in the field of child abuse, his desire is to search for and identify real and effective worldly and spiritual remedies for healing for himself, and most importantly for others who have suffered from these calamities. He lives in New England with his wife. In addition to “Love and the Infinite, My Memoirs,” his first book publication, Dunn has written a number of narratives, articles, as well as formal reports on environmental protection. To know more about the author and his book, visit http://www.myloveandtheinfinite.com.